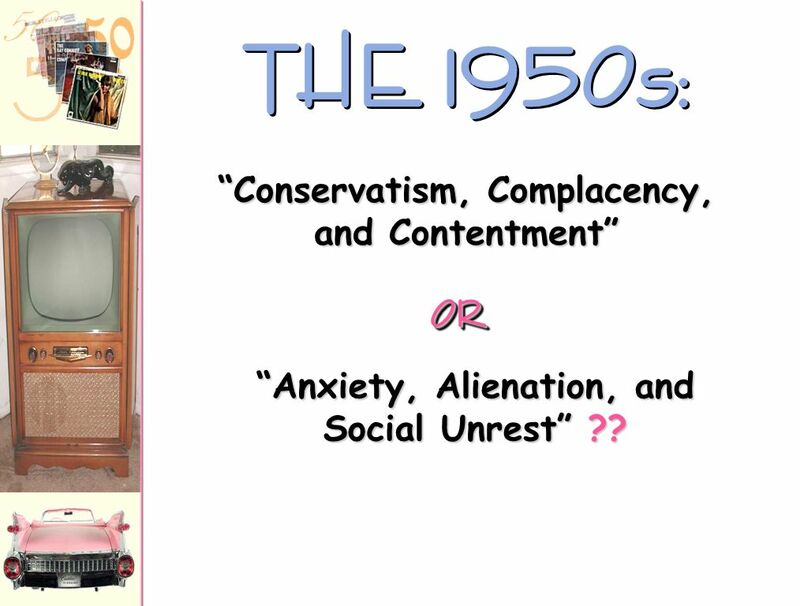 THE 1950s: “Conservatism, Complacency, and Contentment” OR “Anxiety, Alienation, and Social Unrest” ?? 2B. 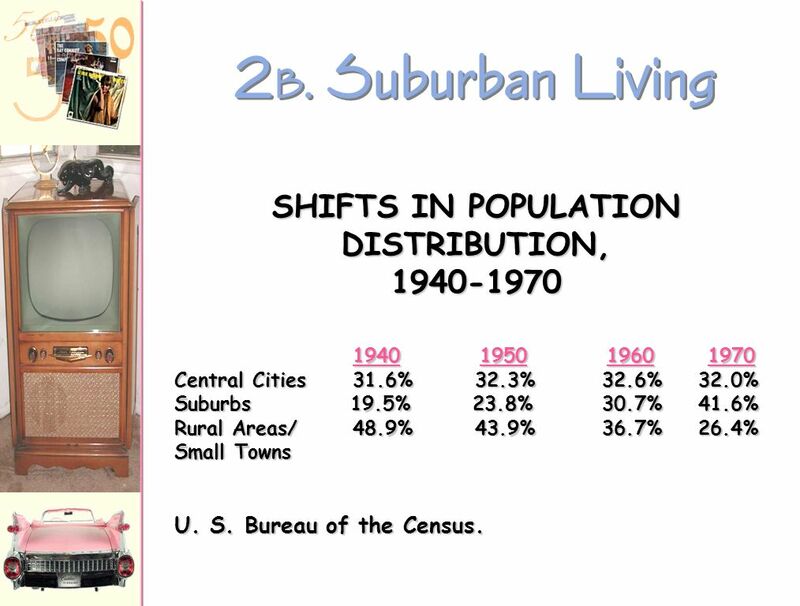 Suburban Living SHIFTS IN POPULATION DISTRIBUTION, Central Cities % % % % Suburbs % % % % Rural Areas/ % % % % Small Towns U. S. Bureau of the Census.  factory workers decreased by %, eliminating 1.5 million blue-collar jobs. 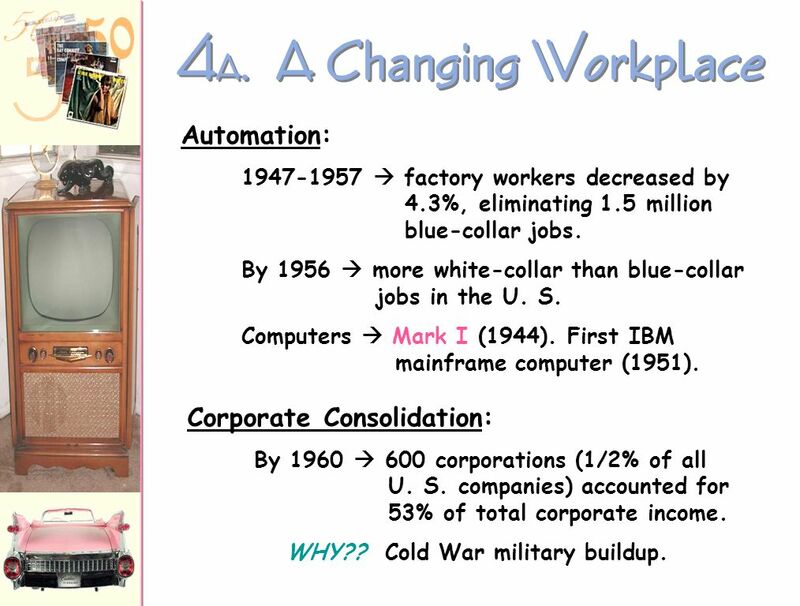 By 1956  more white-collar than blue-collar jobs in the U. S. Computers  Mark I (1944). First IBM mainframe computer (1951). Corporate Consolidation: By 1960  600 corporations (1/2% of all U. S. companies) accounted for % of total corporate income. WHY?? Cold War military buildup. 5 5A. 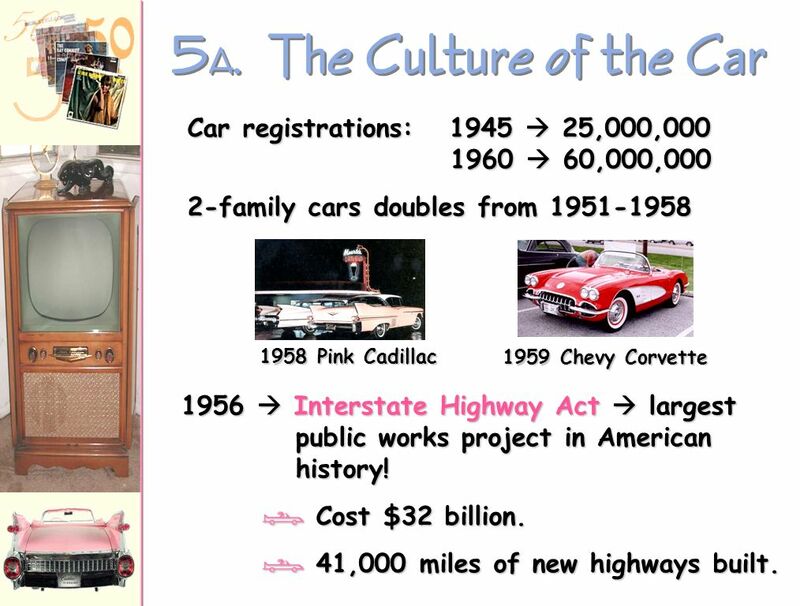 The Culture of the Car Car registrations:  25,000,  60,000,000 2-family cars doubles from 1958 Pink Cadillac 1959 Chevy Corvette 1956  Interstate Highway Act  largest public works project in American history! Cost $32 billion. 41,000 miles of new highways built. 8 6A. 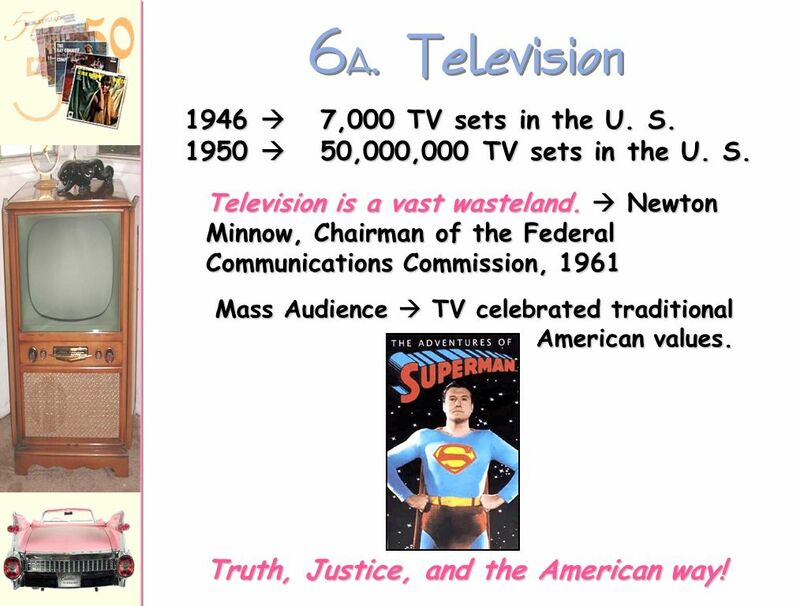 Television Truth, Justice, and the American way! 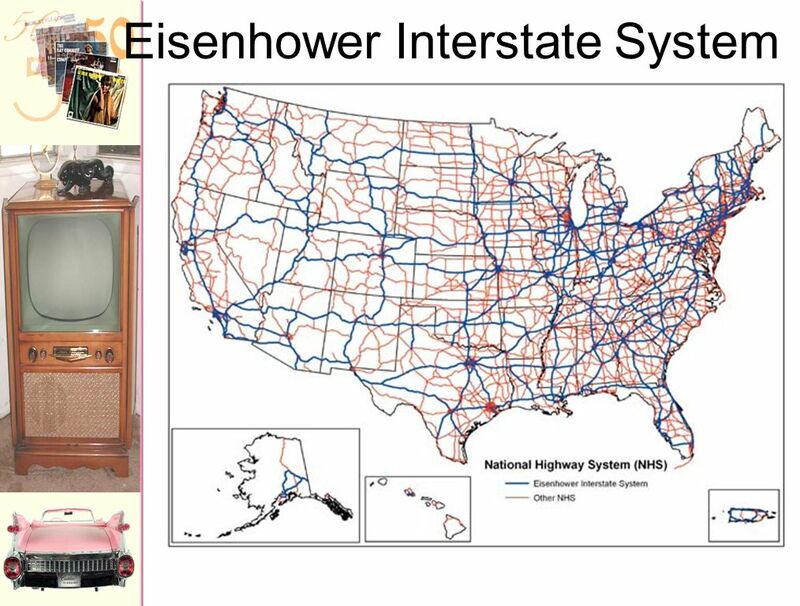 1946  7,000 TV sets in the U. S  50,000,000 TV sets in the U. S. Television is a vast wasteland.  Newton Minnow, Chairman of the Federal Communications Commission, 1961 Mass Audience  TV celebrated traditional American values. Truth, Justice, and the American way! 10 7B. 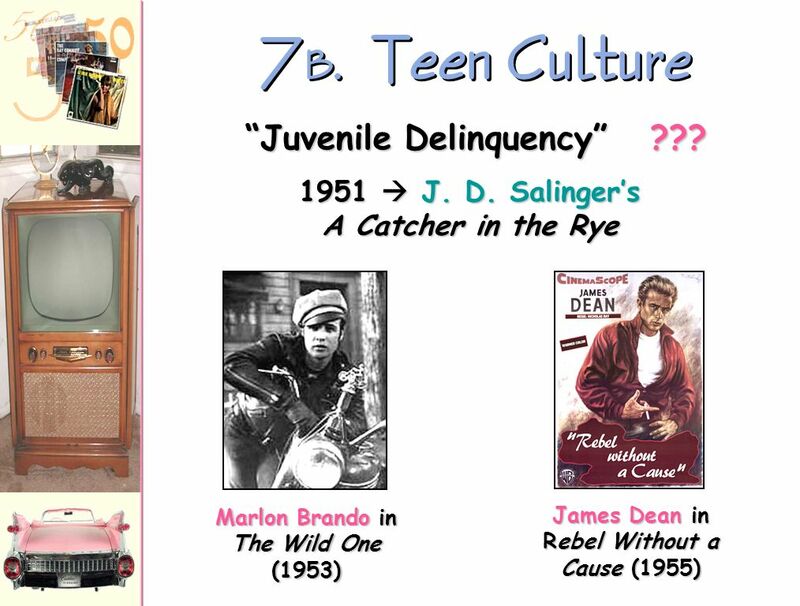 Teen Culture “Juvenile Delinquency” ??? 13 8A. 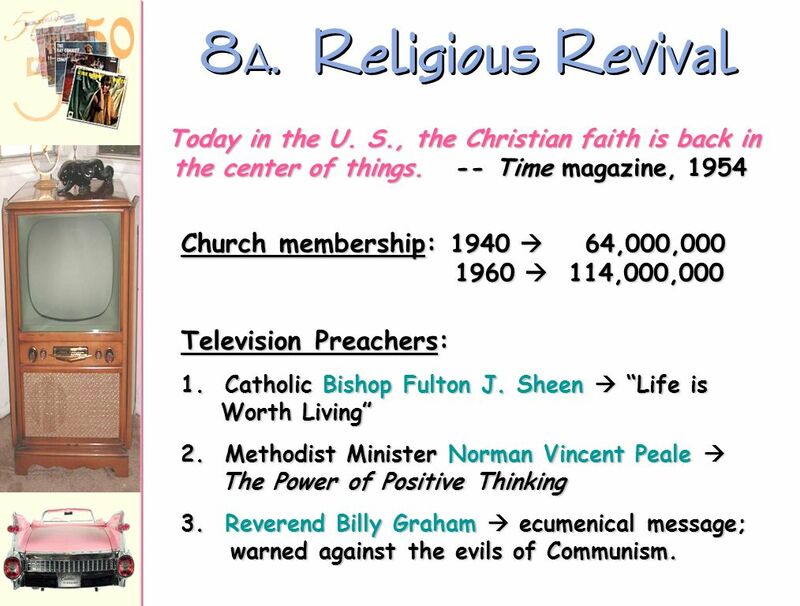 Religious Revival Today in the U. S., the Christian faith is back in the center of things Time magazine, 1954 Church membership: 1940  64,000,  114,000,000 Television Preachers: 1. Catholic Bishop Fulton J. Sheen  “Life is Worth Living” 2. Methodist Minister Norman Vincent Peale  The Power of Positive Thinking 3. Reverend Billy Graham  ecumenical message; warned against the evils of Communism. 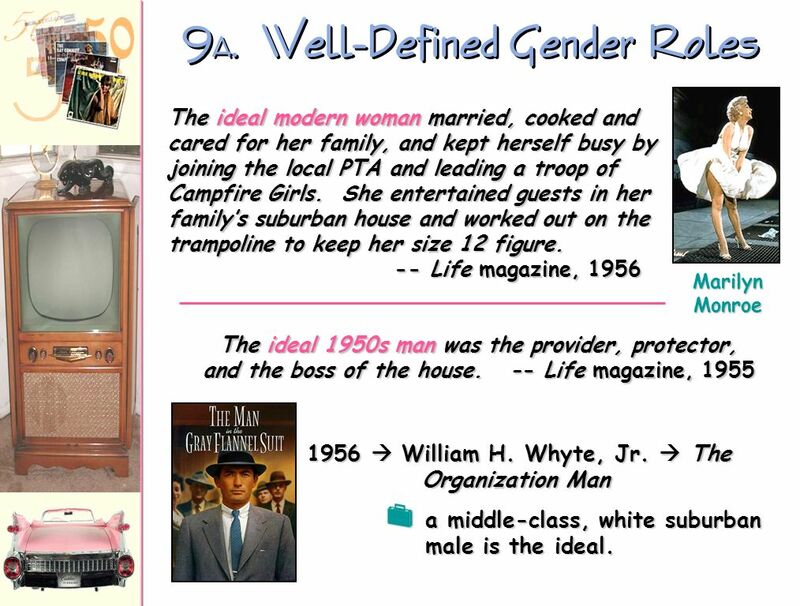 The ideal modern woman married, cooked and cared for her family, and kept herself busy by joining the local PTA and leading a troop of Campfire Girls. She entertained guests in her family’s suburban house and worked out on the trampoline to keep her size 12 figure Life magazine, 1956 Marilyn Monroe The ideal 1950s man was the provider, protector, and the boss of the house Life magazine, 1955 1956  William H. Whyte, Jr.  The Organization Man a middle-class, white suburban male is the ideal. 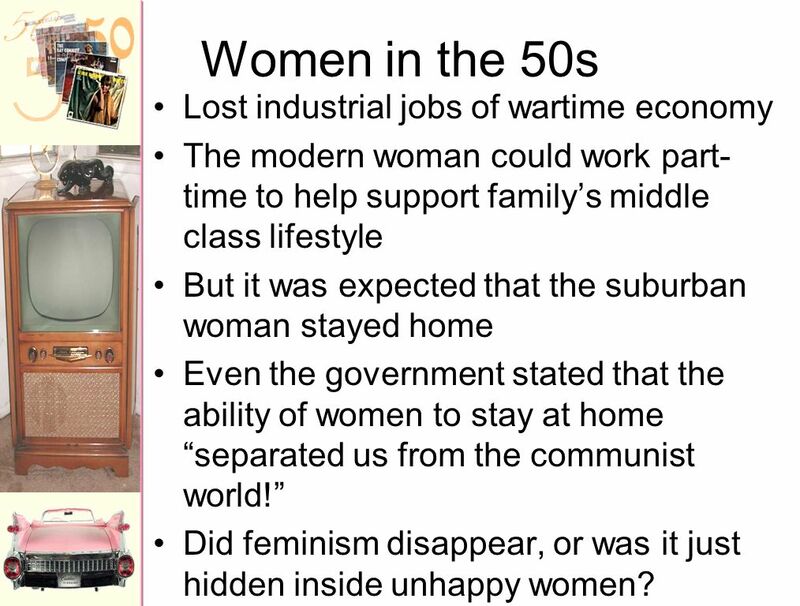 The modern woman could work part-time to help support family’s middle class lifestyle But it was expected that the suburban woman stayed home Even the government stated that the ability of women to stay at home “separated us from the communist world!” Did feminism disappear, or was it just hidden inside unhappy women? The postwar era witnessed tremendous economic growth and rising social contentment and conformity. 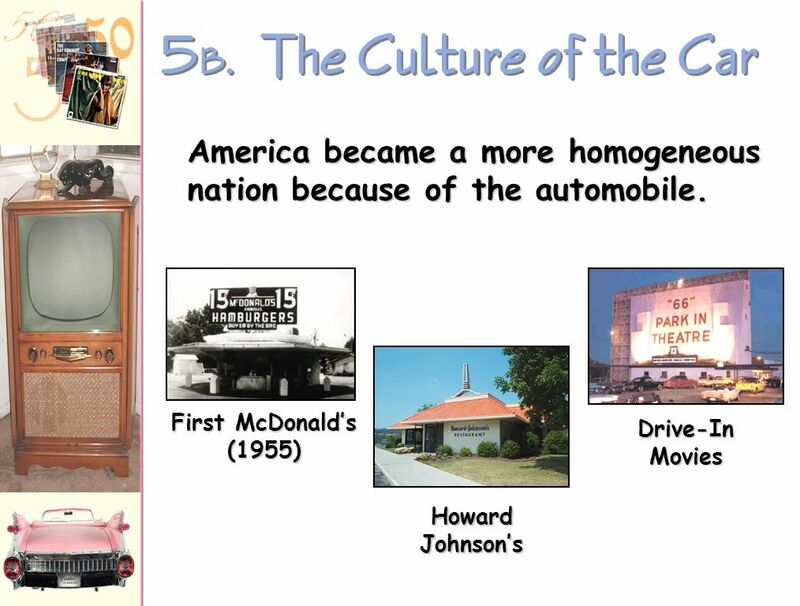 Yet in the midst of such increasing affluence and comfortable domesticity, social critics expressed a growing sense of unease with American culture in the 1950s. 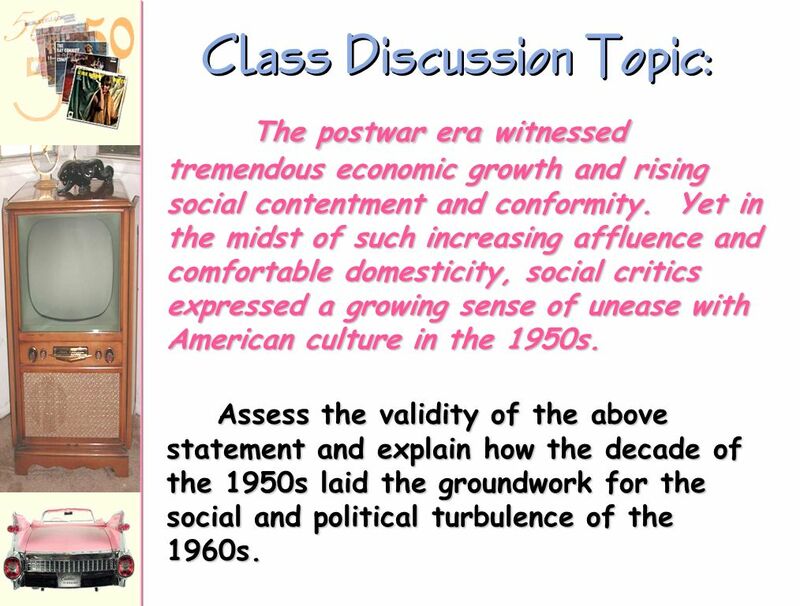 Assess the validity of the above statement and explain how the decade of the 1950s laid the groundwork for the social and political turbulence of the 1960s. Download ppt "“Conservatism, Complacency, and Contentment” “Anxiety, Alienation, and"
The Eisenhower Years Life in the 1950s 26.4 & 26.5. 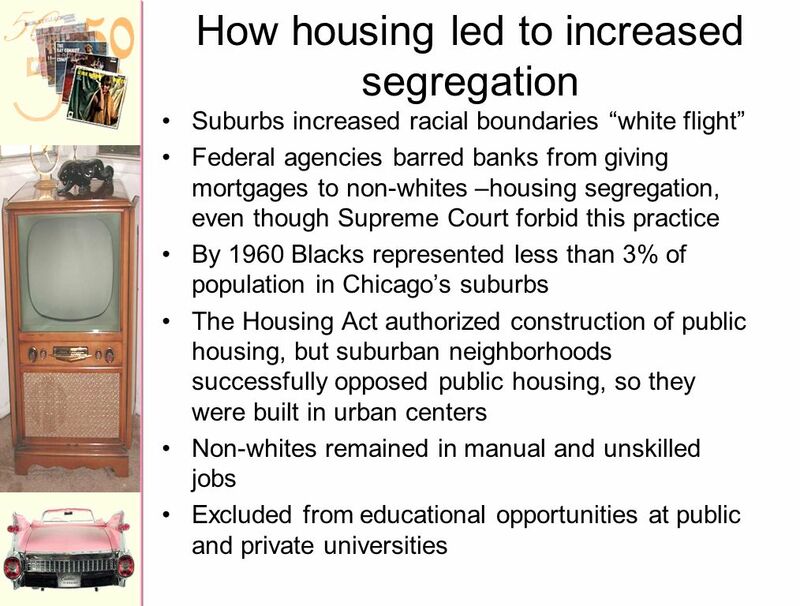 AP US History THE 1950s: POST WAR AMERICA Postwar America Returning Veteran Issues: 10 million released from service in 1946 –Finding employment –Housing. 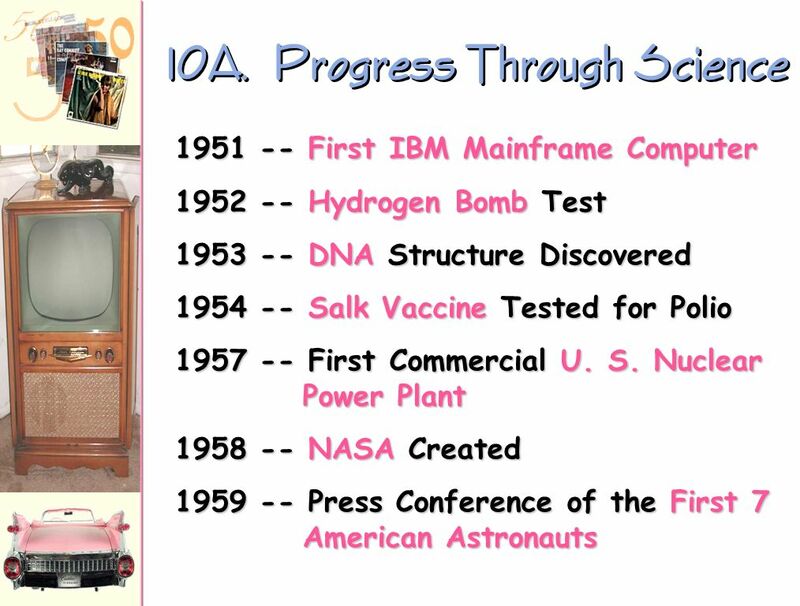 THE 1950s: “Anxiety, Alienation, and Social Unrest” ?? “Conservatism, Complacency, and Contentment” OROR 17.3. 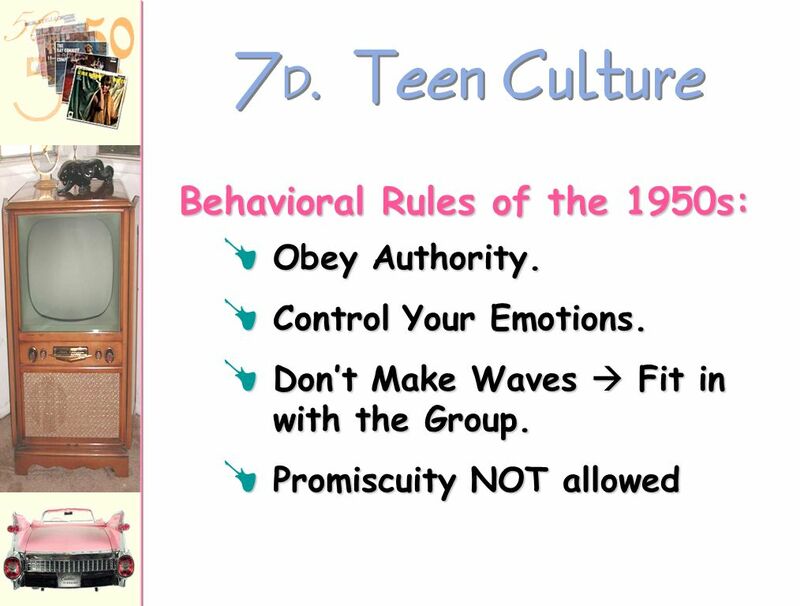 THE 1950s: “Anxiety, Alienation, and Social Unrest” ?? “Conservatism, Complacency, and Contentment” OROR. Postwar America Unit 7 Chapter 14 GI Bill Servicemen’s Readjustment Act provided: Low interest loans for new home purchases Loans to start businesses. Friday Warm-up Make your paper look like this American Dream in the Post War World ______________________________________________________ Suburban Living. 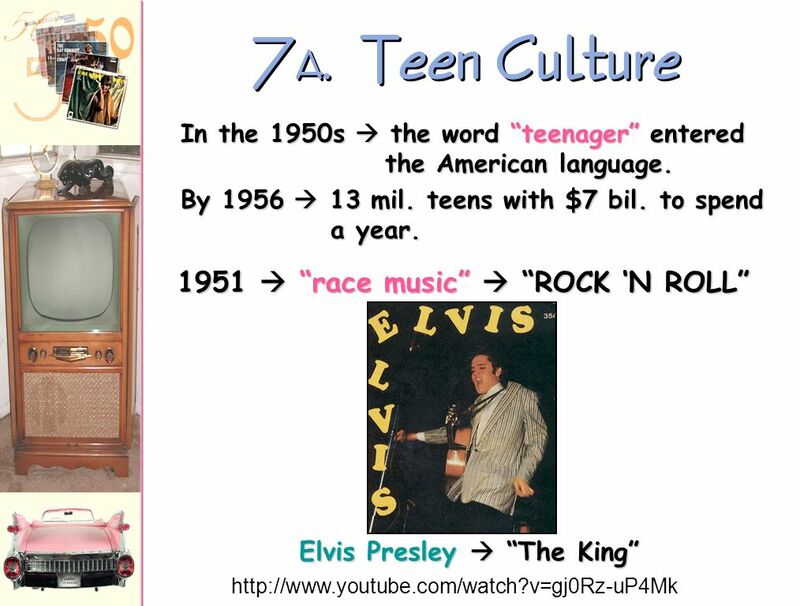 THE 1950s: “Anxiety and Social Unrest” ? “Prosperity and Contentment” OROR. 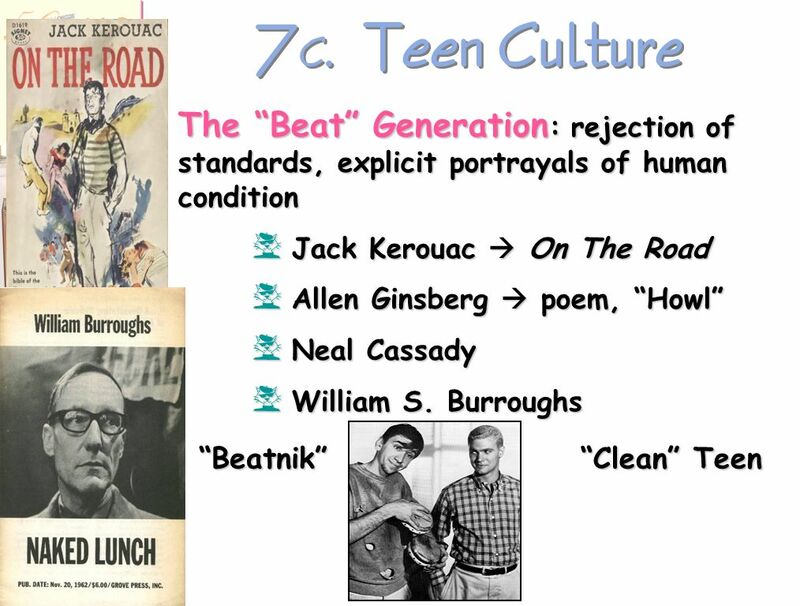 Adapted from: Ms. Susan M. Pojer Horace Greeley HS Chappaqua, NY THE 1950s: “Anxiety, Alienation, and Social Unrest” ?? “Conservatism, Complacency, and. Mr. ButtellAMH Honors WBHS Mr. ButtellAMH Honors WBHS 1950s The Postwar Boom. 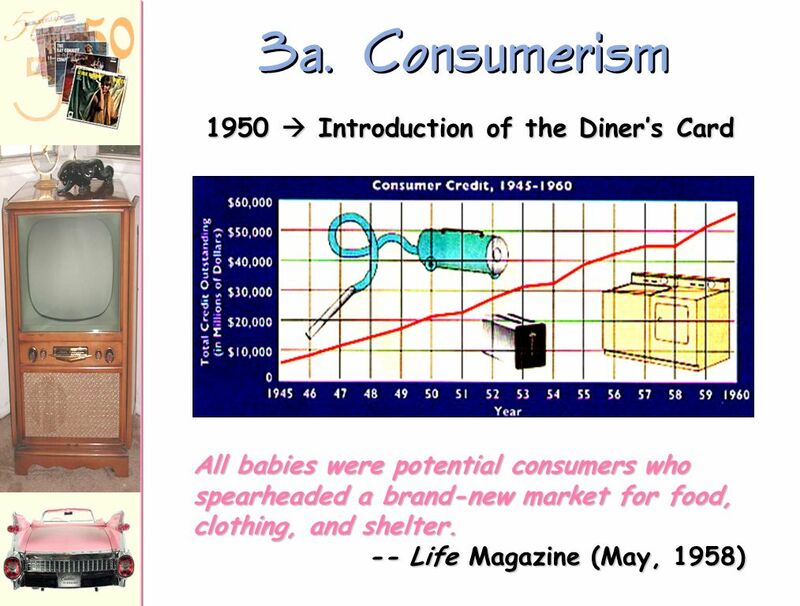 Consumerism in the US History of Consumerism Central Paradox: How did the Puritan tradition of thrift and asceticism turn into a culture of spending.